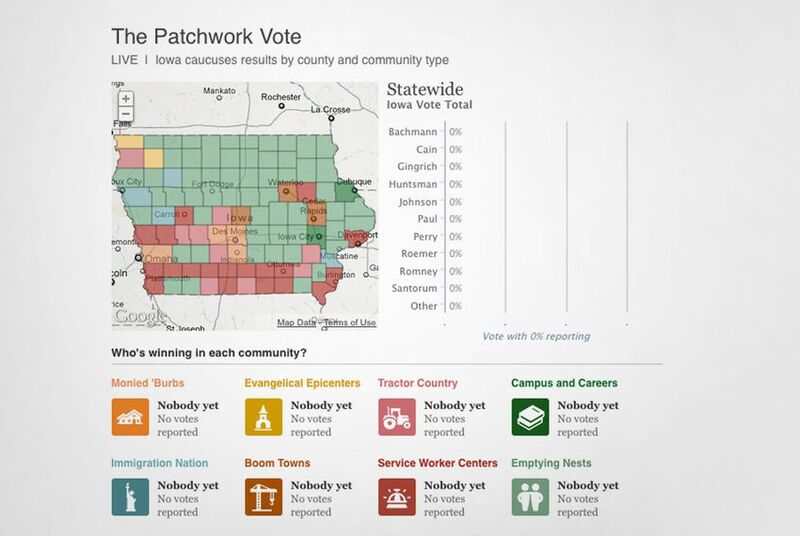 Want to track the results live in Iowa? Using data provided by the Iowa Republican Party via Google, WNYC has built an embeddable app that will update live as results come in this evening. Update:We have added Google's version of the map below WNYC's. Want to track the results live in Iowa? Using data provided by the Iowa Republican Party via Google, John Keefe at WNYC has built an embeddable app that will update live as results come in this evening. The counties on the map are color coded according to demographic and cultural data by Patchwork Nation, a reporting project of the Jefferson Institute that examines communities based on their characteristics. The map can be viewed below. The polls officially open in Iowa at 7 p.m., and results should start flowing in within the hour. Keep an eye on the Texas Tribune for updates on location in Iowa. Hover over counties on the map to view voting results in the chart to the right of the map. Click on the icons below the map to see explainations of each community type, and to see the voter breakdown according to those categories. This map updates live as results are reported to Google by the Iowa Republican Party. Click on a candidate's name to see counties shaded by gradients in support of a candidate. The darker the color, the larger the support.